What is Cradle Cap? How to treat it? 1 What causes cradle cap? 3 Home treatment that is usually needed for cradle cap. 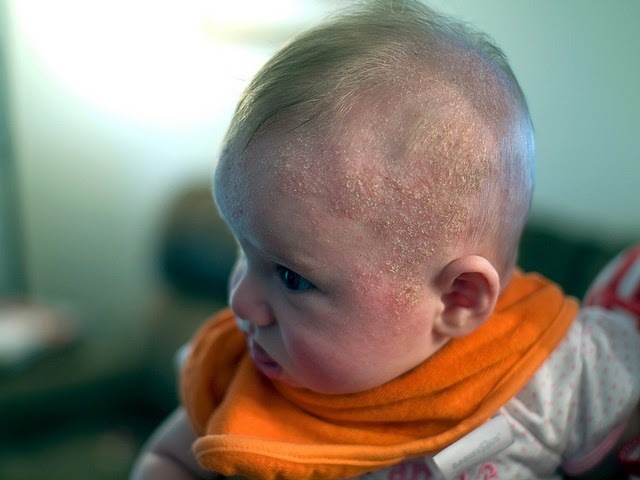 Cradle cap, the common term for infantile seborrheic dermatitis, causes scaly patches on baby’s scalp. Though a cradle cap isn’t serious, it can causes thick crusting and white or yellow scales. Cradle cap usually resolves on its own within a few months. Self-care measures like washing your baby’s scalp daily with a mild shampoo, it helps loosen and remove the cradle cap scales. If cradle cap persists or may seems severe, your doctor may suggests a medicated shampoo, a lotion or other treatment. The exact cause of Cradle cap is still unknown. Factors like a poor hygiene or lack of proper baby care have not been established as valid reasons. Allergies or infections are ruled out as possible causes. However, many researchers believe that it is a hereditary disease, as the condition is seen to run in the families. This disorder is also supposed to affect babies who have a hyperactive sebaceous gland or oil-producing gland. Newborn babies will normally still have their mother’s hormones in their circulatory system. If the mother has overactive oily gland, it may be also present in the baby for a period of time. The glands may bring about a Cradle cap. In a very few cases, babies with a cradle cap will have skin that is a little red or itchy, and some might even have hair loss, though the hair usually grows back after the cradle cap is gone. Home treatment that is usually needed for cradle cap. An hour before shampooing, rub on your baby’s scalp with baby oil, mineral oil, or petroleum jelly to help lift the crusts and loosen scales. When ready to shampoo, get the scalp wet first, then gently scrub the scalp with a soft-bristle brush (a soft toothbrush works well) for a few minutes to remove the scales. You may also try gently removing the scales with a fine-tooth comb. Then wash the scalp with a baby shampoo, rinse well, and gently towel dry. If you suspect your baby to be suffering from Cradle Cap, take your baby to a pediatrician. Doctors will immediately start treating Cradle Cap after careful observation of the affected area. In some cases, the doctor will advise some physical tests to be carried out to rule out other disorders. Professional cure for Cradle Cap generally includes medications and creams. Apart from an antifungal shampoo or cream, individuals that affected by this, may also be recommended to use a mild steroid scalp lotion. However, using steroids can be harmful for health and due to this reason such lotions should not be used for a long time. HIV and AIDs Affect the Eye?